Millions of people grew up in the '80s and '90s as fans of Teenage Mutant Ninja Turtles, but most of those people may not realize that their conception of the iconic reptilian warriors -- and their stories -- stems from the 1987 cartoon, not the original Mirage-produced comics. For instance, the cartoon introduced the Turtles' definitive characteristic - the color-coded masks. The series also introduced a number of characters, including the brainy villain Krang, who is making his live-action debut in Dave Green's Teenage Mutant Ninja Turtles: Out of the Shadows. Unfortunately, with a character like Krang, there is a plethora of unanswered questions regarding his origin, his banishment, his body, and so forth. In fact, he seems to be the primary subject of most debates regarding the original Teenage Mutant Ninja Turtles cartoon. There is so much inconsistency throughout the franchise that it's best to consider each installment -- be it a cartoon, comic, or video game -- a separate entity and just enjoy the ride. 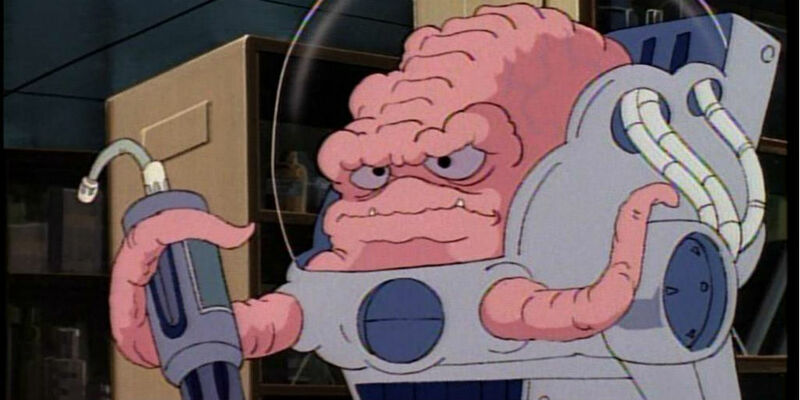 With all that in mind, here are 10 Things You Need To Know About Krang. The Mirage-produced Teenage Mutant Ninja Turtles comics was in its third year when David Wise adapted the series for the small screen. The cult-favorite Ninja Turtles were a foreign concept to television audiences, so when Wise's Teenage Mutant Ninja Turtles cartoon debuted in December 1987, he wanted to create something that would appeal to both fans of the comics as well as new viewers. That is why he borrowed one supervillain from the comics -- the Shredder -- which also creating one of his own -- Krang. Since Krang was Wise's creation, the alien warlord first appeared in the second episode of the Teenage Mutant Ninja Turtles cartoon, "Enter the Shredder," which led to him becoming one of the most iconic and recognizable Ninja Turtles villains. After a massive popularity boom, Krang made the jump from the small screen to the comic page in the first issue of Teenage Mutant Ninja Turtles Adventures, though, along with Bebop and Rocksteady, he was phased out early on and only reappeared during stories involving alien threats. While the comics were dark, gritty, and bloody, that's not the type of TV series Wise wanted to make. The 1987 cartoon was going to be a kids show, so going full steam ahead with Japanese-style fighting wasn't an option -- which is why Wise opted to create the supervillain Krang as a way to alleviate the violence. "In a kids' show, you can wail on robots with swords and nunchucks with complete impunity because they're robots! You're not really hurting anyone. You're just smashing up machinery," Wise said in 2014, recalling how the series initially came together. Introducing an extraterrestrial threat like Krang -- an alien with superior technology -- allowed for the series to maintain some of its gritty roots while also relying heavily on Sci-Fi elements as a form of excuse. Wise could get away with a lot more if an army of robotic foot soldiers were terrorizing the Ninja Turtles instead of an army of men -- and vice versa. Speaking of Sci-Fi elements, Krang is more than just a mere extraterrestrial threat; he's from another galaxy! Krang hails from Dimension X, a distant cluster of galaxies in the multiverse that is military-dominated, with an atmosphere -- consisting of nitrogen, sulfur, water, and various hydrocarbons - that will dissolve anything from the Turtles' galaxy. Before commencing his conquest for Earth, Krang and his trusty engineer Von Drakus aka Berserko built a spherical base that doubled as a teleportation device called the Technodrome, which allowed Krang to travel instantaneously between Dimension X and Earth. Upon completing construction on the Technodrome (which bears a resemblance to Star Wars' Death Star), Krang banished Drakus, who eventually ended up on Earth. Not much later, Krang himself was exiled from Dimension X and also ended up on Earth, where he met and befriended the iconic Turtles villain Shredder. Krang is not an enticing character to look at; anything more than a fleeting glance may be unnecessary. He's a spongy, brainy-looking creature who utilizes mechanical bodies to move around. Though he was an original creation by David Wise for the 1987 cartoon, he wasn't entirely an original design. Wise previously mentioned that he adopted designs of characters already introduced in the comics and blended them with his personal ideas to create characters like Krang and April O'Neil. The original Mirage-produced comics contained aliens known as the Utroms; tiny, tentacled aliens who resemble a human brain. They were the primary source of inspiration for Krang, though, for many years, Krang was incredulously regarded as not being an Utrom, despite the two alien species' distinct similarities. As previously mentioned, despite Krang and the Utrom aliens sharing numerous similarities, they are not the same. It's vastly believed (though unconfirmed) that while the Utroms are naturally brain-like creatures, Krang is not; rather his banishers disembodied him when he was exiled from Dimension X, leaving him with only his brain. Furthermore, the Utrom aliens are said to be from a planet within the Milky Way galaxy, whereas Krang is from Dimension X, a distant cluster of galaxies. However, it's later revealed in the IDW continuity that Krang is, in fact, an Utrom and sits upon the Utrom High Council. In that series, Krang becomes the sole surviving member of the Utrom species, and he makes it his life mission to use the Technodrome to terraform Earth into the New Utrominon, so his species may once again live. According to the IDW TMNT comics, Krang was a tyrant on the planet Utrominon, where he commanded an army of Rock Soldiers. When he was exiled to Earth, Krang was stripped of his body but was able to bring the Technodrome with him. Upon reaching Earth (where he earlier banished his engineer Von Drakus to), Krang formed an alliance with Shredder. Shredder agreed to build Krang an android body if Krang would allow him and his Foot Clan to move into the Technodrome. It was a quid pro quo that ended up lasting throughout the cartoon's complete run. The bizarre-looking body endowed Krang with superior weaponry (the suit's arm could shapeshift into weapons like axes and maces) and gadgets, as well as the ability to grow to monstrous sizes. There is an ongoing debate over which suit is better: the android body or the bubble walker. While the android body was physically powerful and functionally better, especially when battling the Ninja Turtles, the bubble walker was, well, cooler. The suit -- which stood upon two mechanical legs, with two holes allowing Krang to extend his tentacles through -- was essentially a glorified scooter for the alien, providing no superhuman capabilities whatsoever. Interestingly, the bubble walker seems to not contain any controllers, thus leaving the only logical explanation for how Krang manages to pilot the machine is via brain waves, though that has never been confirmed. While the android body was far superior, Krang would use both suits interchangeably -- which produced some bewilderment amongst fans. But considering that Playmates' first Krang toy featured the alien in the bubble walker, it only made sense to show the supervillain using both the android body and bubble walker to increase sales. The 2012 Nickelodeon TV series - which was the third television installment in the TMNT franchise - took the story in a different direction. One of the ways the series differentiated from previous chapters was its introduction of The Kraang alien species - voiced by legendary voice actor Nolan North - who were modeled after the Dimension X alien warlord Krang from the 1987 and 2003 cartoons. The Kraang not only played a significant role as the Turtles' main antagonist in the series' first two seasons, but they were also essential in the Turtles' origin. During an altercation with The Kraang, the aliens' chemical mutagen caused the Turtles to mutate into humanoid ninja warriors. In many ways, The Kraang was the Nickelodeon version of the Utroms from the Mirage comics and 2003 TV series; they even shared the same brain-like appearance. Though Krang has appeared in several cartoons, comic books, and video games, he's never appeared on film before. That will all change with Dave Green's Teenage Mutant Ninja Turtles: Out of the Shadows, which introduces the dimension-hopping Krang leading an extraterrestrial invasion of Earth. Teenage Mutant Ninja Turtles director Jonathan Liebsman and producers Brad Fuller and Andrew Form previously mentioned they had plans to introduce Krang and Dimension X in the first movie but felt that would detract from the story they were trying to tell. Now that the Turtles have been established, however, franchise creatives have more leeway with the sequel. Since Paramount's Ninja Turtles series is live-action, Krang's depiction will have to be "realistic." “I think seeing Krang is going to be trippy,” franchise star Megan Fox said at CinemaCon 2016. “He’s a very weird looking character. They’re going to make him real. He’s not a cartoon.” You can catch a glimpse of what he looks like by watching one of the many TV spots circulating the airwaves. Unfortunately, fans will never get to find out what Fuller meant by that, seeing as Armisen dropped out of the project earlier this month due to scheduling issues and was subsequently replaced by Everybody Loves Raymond star Brad Garrett. It's worth noting that Armisen's casting as Krang was announced by Fuller and Form during their WonderCon panel but was never confirmed by Paramount. Perhaps they knew there was a chance Armisen wouldn't be able to fulfill his duties voicing Krang.